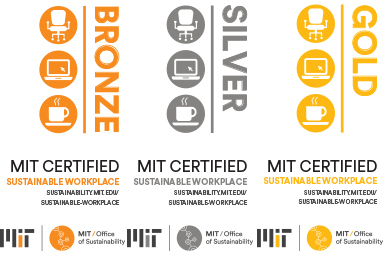 The MIT Sustainable Workplace Certification Program is meant to drive a sustainable transformation across the campus workplace culture at MIT. The program is designed to empower staff, faculty, and student workers to take a leadership role in implementing strategies and practices that will make their workplace a healthy, resource-efficient, proactive steward of the Institute and our planet. Workplaces can achieve certification based on the score they receive on a checklist of sustainable criteria. Transform the workplace culture of MIT through active engagement and leadership on sustainability issues, aligning our office operations with the spirit of innovation and stewardship that MIT is known for. Reduce negative environmental and health impacts associated with workplace operations, which can save money, boost productivity, and protect MIT and the planet from future harm. Download the Sustainable Workplace Checklist and save it to a central location where you and your colleagues can regularly access it (NOTE: You must click "enable macros" when you open the Excel spreadsheet). Assemble a team and begin to fill out the checklist with your Office’s current practices. Check items that your workplace might like to “make a plan” to implement in the future. Click the “refresh” button on the planning sheet tab to see what items your workplace can strive for. As a team, decide how to accomplish these new items. As you make improvements in your office, update the checklist, and your preliminary score will automatically update. When you are done filling out this form, you will see your final score at the bottom of the page. When you achieve your desired level of certification, submit your checklist to sustainablemit@mit.edu. The Office of Sustainability will review and finalize your score and level of certification. You can achieve either a Bronze, Silver, or Gold level certification! Contact the Office of Sustainability with questions: sustainableMIT@mit.edu.